"Hello, America. This is Edward R. Murrow." It's three-thirty in London. Across three thousand miles of tossing sea, it is ten-thirty in New York—along toward the end of the evening, nearly bed-time for all the folks who must be up and working the next morning. It's nearly bed-time for Ed Murrow too. But unlike his working compatriots in New York, he won't get eight hours of sleep. He'll be lucky if he gets four, and more likely it will be three or even two. Or maybe none at all, if something should happen. The time when Ed Murrow worried about not getting enough sleep is past—long past. He's pretty well used to it now, and he has more important things on his mind. He might very easily worry about whether the office where he works or the apartment building where he lives will still be left standing, brick on brick, by the time another British dawn rolls around. As a matter of fact, he doesn't worry much about that, either. Chiefly concerning him at the moment, and at all moments, is his job. For Ed Murrow is European Director for the Columbia Broadcasting System, and he must keep his finger on the pulse of all Europe. He must get the news, he must get it straight, he must write it, he must submit it to the censors, he must clear the time for broadcasting it to the United States, and he must talk it into a microphone. Of course he has assistants, but not as many as you'd expect. And anyway, he's the boss. Seeing that things run right is his responsibility, and no one else's. It wasn't like this in the old days—away back in 1937 when Ed first went to London as CBS' European director. Then his job, while important enough, was a matter of arranging quaint broadcasts like an interview with a London cabby, or an on-the-spot show which was accurately titled, "Saturday Night in the Spread Eagle Pub at Little Barfield, Sussex." Or he would see to it that George Bernard Shaw or H. G. Wells or the current party whip in the House of Commons was persuaded to say a few well-chosen words for the benefit of American listeners. No crises, you see, and not much lost sleep. But although not many people in the world seemed to realize it, even in those days Ed Murrow, and the Columbia Broadcasting System, knew that crises were on their way. Ed knew it because he already had important sources of information in Europe, and CBS must have known it, because they chose Ed for the job. Ed Murrow was born in North Carolina thirty-six years ago. His family moved westward when he was a boy, and he attended the University of Washington and Washington State University. After that, he went to Stanford and got a Master of Arts degree. He was elected president of the National Student Federation, and in 1932 he became assistant director of the Institute of International Education—a job that sent him traveling around the United States, visiting colleges and arranging debates, lectures, and exchange scholarships. Summers, still as assistant director of the Institute, he guided student tours through Europe, incidentally meeting and talking to foreign members and officials of the Institute. Knowing all these intellectual and well-informed citizens of Europe made Ed Murrow an ideal representative for CBS. But knowing them turned out, also, to be one of Ed's great personal tragedies. As nation after nation disappeared under the tide of Hitlerism, many of Ed's friends disappeared too. Some of them he has never heard of since. Of others, months later, he has learned that they are dead, in concentration camps, or penniless fugitives. In March, 1938, Ed was on his way to Latvia and Lithuania when word game to him in Warsaw that Hitler's Germany had finally effected its cherished "Anschluss" with Austria. Ed had to get to Vienna, of course, but the only transportation available was a 23-passenger airplane—so he chartered it and flew in it to Vienna, a lone passenger. At the Vienna airport he found that the German troops had commandeered all buses and taxis, so he made the last part of the journey on foot. At that, he was lucky. Nowadays there wouldn't be a 23-passenger plane available. Before the war, Ed used to fly a great deal over Europe, co-ordinating CBS activities, but now, naturally, he remains in England. Through the crisis years he watched communication between himself and his assistants in European key cities get more and more difficult. He always knew when a crisis of some kind was brewing, and where, because for a day or so ahead of time it would be impossible to get long-distance telephone calls through to that particular city. Frequently he had to resort to ridiculously roundabout methods to get instructions through to CBS men in the Axis countries—like sending a cable to Berlin by way of South America. When you consider all the difficulties Ed Murrow must overcome in getting the news and broadcasting it to America, you're apt to conjure up a picture in your imagination of a hard-hitting, aggressive individual. On the contrary, Ed is very quiet and very diplomatic. When he talks to you he looks directly into your eyes and speaks in a rather hurried, low voice. He doesn't often smile, which is natural enough, but he never loses his temper, which is remarkable, in view of the extreme nervous tension under which he works and lives. He's a good reporter, but he is mainly interested in the meaning of the facts he reports—likes to look past them to the underlying forces and trends to which they are clues. In the present world, he's like a man watching a volcano erupt—he sees the smoke and flame, but he's busy thinking about the greater chaos beneath the surface of the earth, and trying to decide what caused it, and where it will break out next. In his broadcasts, though, he sticks to the facts, and almost never editorializes. He did make one blood-chilling remark, though, which becomes more frightening the more you ponder it. "I believe," he said, "that this war is for the control of men's minds." Ed is married to a very pretty young American woman whose name is Janet, and they live in a flat across the street from the CBS offices and near the BBC building. Early this summer, when CBS made arrangements to evacuate the wives of its correspondents in European capitals, Janet refused to leave. They have no children, and Janet said that her only responsibility was to stay with Ed. Janet furnished their flat herself, and though she didn't stick to any one period of decoration, she has excellent taste and created a charming home. There are a few New England antique pieces which she brought over with her from the United States, plus some modern furniture purchased in England. Ed's study is filled with American Indian rugs and pottery which he collected as a hobby in the days when he was traveling around the United States. Janet is an accomplished pianist, and Ed is making a reporter out of her as well. Frequently he puts her on the air with stories about London's food supply or the evacuation of children. The Murrows haven't much time now for entertaining, but they used to do a great deal. Janet, who does most of the cooking herself, would go to Selfridge's, the big London department store, and buy American ham or bacon, coffee, and maple syrup, and on Sunday mornings they would invite people in for real middle-western American breakfasts. The imported delicacies were expensive, but delicious, since no American living abroad ever gets used to English breakfasts. Ed has managed to cultivate a taste for English cigarettes, but not Janet—she still shops for the American kind. Home life for Ed and Janet since Germany marched into Holland has been confined to brief meetings at odd moments, and occasionally to nods across the width of street which separates the windows of the Murrow apartment from those of the Murrow office. They are living in the same city and under the same roof, but the times are so far from normal that Janet sees almost as little of her husband as if he were in the army. In a way, he is. For if you believe as he does, that the war is for control of men's minds, radio, with its command of so many millions of ears, is on the firing line. 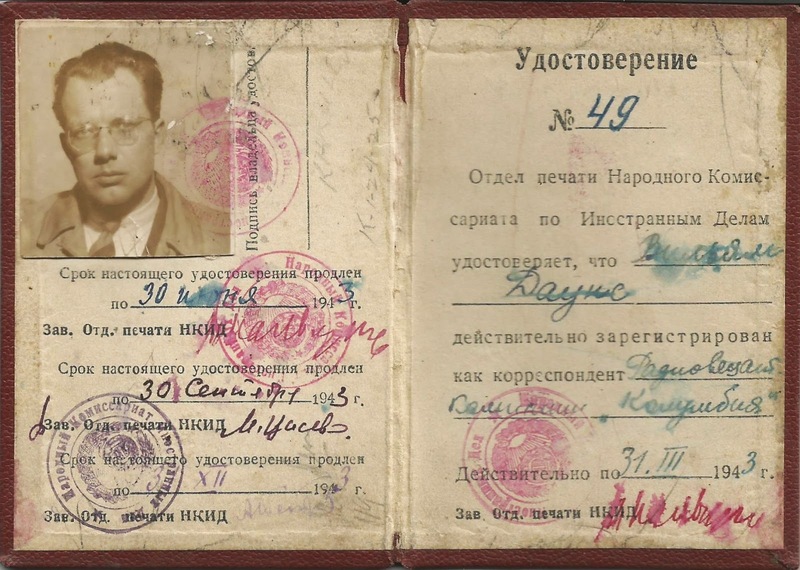 Bill Downs' Soviet ID: "The People's Commissariat for Foreign Affairs certifies that [Bill Downs] registered as a correspondent." In June 1941 the German invasion of the Soviet Union shocked the world. For Western reporters, an assignment to Russia became a chance to witness firsthand the largest military front in human history. Those who were able to get the post, however, found it a frustrating, disappointing, and often tedious affair. For four years foreign correspondents lived in the city's Hotel Metropol along with their secretaries and translators. Their provisions were tight, but better than those allotted to the average Muscovite. 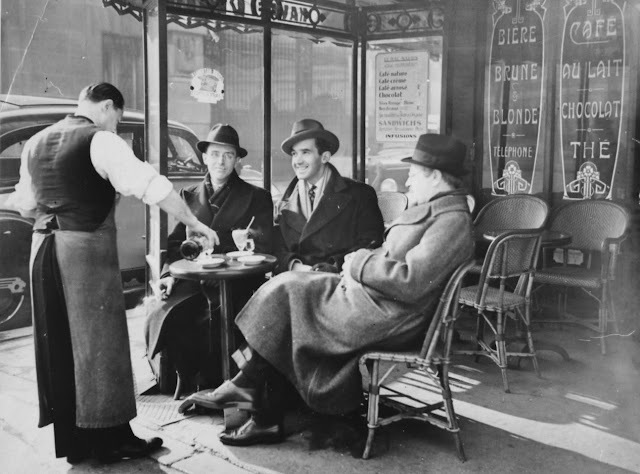 The journalists had enough to get by, and sometimes even enjoy themselves, as Bill Downs described in April 1943: "Our entertainment here consists of vodka—which is liquid dynamite—and the ballet or opera—and the occasional poker game with a general or admiral—and an occasional date full of gestures and shouting with a Russian girl." But they were there to do a job, and government officials did not make it easy. The Soviet People's Commissariat for Foreign Affairs had absolute control over the press in Moscow, and party officials were a suffocating presence. Disputes arose over how and what content should be disseminated to Western audiences. Soviet officials knew that information coming out of Moscow could affect worldwide opinion of the country, and perhaps also the perceived viability of its own communist model. Such concern bred paranoia, and any report that they felt went against the government's carefully crafted image of a mighty and modern Russia—no matter how negligible the content—was killed long before broadcast. According to Downs, "There was a fear that the correspondent could, by intonation, change the meaning of his report...When reading your dispatch on the air, there was always an English-speaking Communist broadcaster sitting alongside with his hand on the cut-out switch. If you unintentionally changed the grammar of the sentence, as sometimes happens, down would go the switch and you'd be off the air." Reporters were thus forced to rely on Pravda, Red Star, Izvestia, and other government publications as their primary sources for military updates on the Eastern Front. They paid careful attention to every word as they tried to piece together news. They had little choice, as anyone who went a little too far in challenging the censors was thrown out of the country. "A Moscow correspondent doesn't write, he rewrites, they explained patiently. All the material available has already been published in Russian newspapers, but some slight allowance is made for interpretation if the comment is considered favorable. The only loophole is that the Russian censors' knowledge of English is scanty and their judgment unpredictable. For instance, one worth-while story came from Pravda, eulogizing Russian inventive genius. Pravda told how the Russian inventor, Popov, had invented the radio six years before Marconi, and how other Russians were responsible for the first electric motor, incandescent lighting, the steam engine, the steamship, and a number of other outstanding gifts to mankind. This story had presumably been intended for domestic consumption, but the correspondents were able to cable it out, with a deadpan tribute to Soviet historical genius." Even up-to-date maps of the Soviet Union were difficult to come by, and reporters struggled to determine Red Army military developments en route to targets like Oryol. It became a contest of sorts to see who could make the most accurate projection. No one was correct. Over the years, Soviet officials took correspondents to places of interest both in and out of Moscow. However, unlike their counterparts elsewhere in Europe, these reporters were never taken to the front lines, and they were carefully monitored at all times. Associated Press correspondent Eddy Gilmore recalled an incident from March 1942 in which his train ran out of fuel not far outside of Moscow. It ran on a wood-burning engine, and although it was capable of using other fuel, coal was scarce and reserved for the most essential trains. The train stopped to refuel at the nearest station, and an engineer and a fireman began loading the engine. It was more than a two-man job, however, and members of the foreign press party got out to assist. A frantic press department official ordered them to stop. When it was pointed out to him that the men seemed to appreciate the help, he relented, but warned that he would not approve any stories which mentioned the incident. Things improved somewhat as the Soviets made military gains. 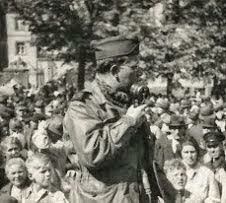 Starting in early 1943, correspondents received guided tours closer to the front lines. They visited liberated cities such as Stalingrad, Kharkov, and Leningrad. In December 1943 officials took the press party to the Babi Yar ravine. Reporters were allowed to interview survivors from the nearby Syrets concentration camp and evaluate what had taken place. It was a firsthand display of Nazi war crimes. However, based on Moscow's track record, some of the reporters felt that certain stories required a degree of skepticism. Just a month later, Soviet officials staged a duplicitous visit to Katyn, a Russian village near which over 21,000 Polish prisoners were executed by the NKVD in 1940. The officials made a show of it. They hoped to convince the Western Allies that this was another Nazi atrocity, in part because Joseph Goebbels had previously used the discovery of the mass graves as a propaganda boon against the Soviets. 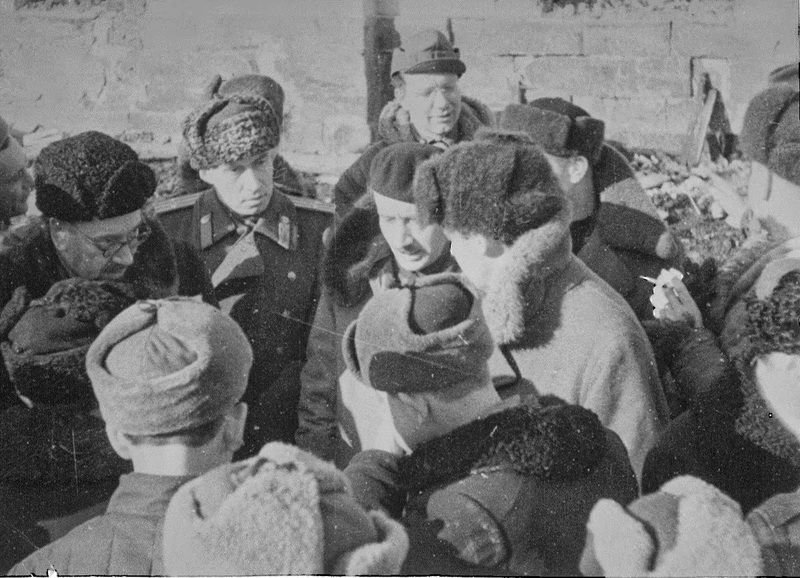 A foreign press party in Rzhev in 1943. Bill Downs is in the center in the far back. At any rate, this era of good feeling was something rare in Russian history, and it has never since been repeated. I might add that the policy at the time did pay off from the Kremlin viewpoint. For the first time we were able to write authoritatively of the tremendous achievements of the Red Army, and the Russians did build up a "bank account" of good will in the outside world. They also managed to create an atmosphere of trust, which was for a long time disappearing. I think the Teheran and Yalta conferences are proof of this. However, it is my observation that the Soviet foreign office did not and does not understand the so-called "banking" of good will and has no interest in such a policy. The relaxation of restrictions on correspondents in 1943 was, I believe, ordered for two reasons: first, a natural pride in the achievements of their army and a desire to tell the world about it; second, to create pressure for a second front. There was and is no compromise with the basic thesis of Communist policy, which is to communize all nations of the world—either through direct conquest or through revolution. Now I'll tackle your questionnaire. 1. Based on your experience, how accurate are reports the outside world gets of what goes on in Russia from resident correspondents? Within the scope of Soviet censorship, the resident correspondent can report accurately on government policy as announced by the Kremlin. However, the resident correspondent is not allowed to report such details as the living standards of the people he sees or the state of the national economy, which he can judge by visiting shops and stores and such news. He is not allowed to report on conversations, say, overheard on the subway or on the buses and streetcars. His isolation from the Russian people is manifold—first by the language barrier, second by the fact that he is restricted for the most part to Moscow, thirdly by government orders against association with foreigners, and fourthly by the atmosphere of fear and suspicion, which is part of the daily life of the people. Outside of a few officials, it is doubtful that even the Russians themselves know what transpires in their country. The citizen of Tashkent is just as ignorant of what goes on in the Urals as is the correspondent in Moscow. Just as the foreign correspondent can be said to exist in the cell of Moscow, it can be said that the ordinary Russian also exists in a cell bounded by the community in which he lives and works. Only occasionally does rumor or a leak in the press break through these barriers which the government has inflicted on the people. 2. What was your personal experience with censorship and its operations, commenting at the same time on your freedom of movement? During my stay in the Soviet Union, the government had the excuse of military security to fall back on. However, it is my belief that fear and suspicion are as much a part of the Russian censorship policy as security. There is another quality that is embraced in censorship policy too. This is pride. For example, we had many long arguments with the censors concerning the reporting of military casualties. The government wanted absolutely no mention of them. Our argument was that the world—and particularly Russia's allies—should know the sacrifices the nation was making in fighting the war. But the attitude of the censor was that a Russian killed in battle somehow reflected on the national honor. There was a constant watch on copy to stop anything—be it a humorous story or what—that might possibly reflect on the Russian "honor." As for the suspicion and fear, the best example I have of that concerns the Battle of Poltava near the end of 1943. I went with my secretary to the Lenin Library to look up the First Battle of Poltava in 1709 when Peter the Great defeated Charles of Sweden. I managed to dig up the number of men involved, the number of horses employed, and the number of guns in that first battle that ended the era of Swedish conquest. I thought it would make an interesting angle to supplement the 1943 battle story. However, the censor stopped all the statistics on that 240 year old battle because, he explained, it is "military information." It was obvious that he suspected some sort of a code. 3. How valuable is the contribution made by experts who analyze the Russian press, radio, and other sources to interpret what is going on in Russia? Should experts be used more widely than they are at present? Analysis of the Russian press and radio is extremely valuable because there is such a scarcity of information coming out of that country that any contribution which leads to greater understanding of it is helpful. Also, the dynamic of Marxism-Leninism-Stalinism calls for a constant watch and reinterpretation of Soviet policy and Communist methods. The controversial nature of the Russian problem makes objectivity difficult to achieve. The more people who attempt to understand and interpret the better. As for using the so-called "experts" more widely, I'd have to know my expert, his background, and his expertise. 4. On the basis of your experience, and in the light of present circumstances, how valuable do you think it is to have a correspondent in Moscow? Most valuable. It keeps open a channel and maintains a precedent by maintaining bureaus in the second most important capital in the world. And while the correspondent on the scene may be allowed little freedom to report, there still are some things that even a dictatorship so complete as the Russian cannot hide from the reporter. He may not be able to report these things from Moscow, but he can report them when he leaves the country. 5. How would you proceed to give better coverage of Russia and the satellites, recognizing all the difficulties that lie in the way; e.g., do you feel that correspondents working in Stockholm, Vienna, Berlin, and Belgrade could improve our coverage because of their strategic location? Considering the difficulties, it is hard to make any practical suggestions as to how to improve coverage of Russia beyond the present efforts being made. It is understandable that networks and newspapers have lost interest in maintaining bureaus in Moscow, but I believe it is most important that they do. The fact that there are so few correspondents in Moscow today would appear, in part at least, due to lack of interest by news distributing organizations to spend the money there. The pressure to get correspondents in has slackened. Trying to report on Russia from the capitals of nations bordering the Iron Curtain is of doubtful value. In Berlin, for example, we were able to see Russian-directed policy for the German Communists. But there was very little to be collected about Russia itself. The only field which I can think of where there could be more comprehensive coverage is the field of foreign trade and economics. I have seen no roundup of what the Soviet Union is buying on the world market—say, machine tools from Belgium, ball bearings from Sweden, textiles from India. Such information would be a valuable addition to the sum total of our day-to-day knowledge of the country. It was a censorship problem that eventually resulted in the Soviet government completely banning radio reporting from Moscow. Press correspondents would submit their copy to the foreign office censorship, where it would disappear. The correspondent could not find out what had been cut from his copy until he was advised by his home office. However, radio scripts were submitted and had to be returned to us for reading on the air. Thus we could see what the censors had cut, and we were able to assess the government's attitude on subjects of a sensitive nature. The government obviously felt that its censorship was not complete. There was a fear that the correspondent could, by intonation, change the meaning of his report. In broadcasting from Moscow, the radio directorate censored the broadcasts, although we protested constantly against double censorship. However, the radio people very seldom tried to improve on the foreign office censorship. When reading your dispatch on the air, there was always an English-speaking Communist broadcaster sitting alongside with his hand on the cut-out switch. If you unintentionally changed the grammar of the sentence, as sometimes happens, down would go the switch and you'd be off the air. I end this letter with a great feeling of inadequacy and frustration. The basic problem, of course, is the two conflicting theories about the function of the press and radio. The Soviet government sees the press only as an arm of the government whose chief duty is to forward the Communist cause. They do not understand—or at least pretend not to understand—the role of the free press outside their country. The Soviet concept of news is that all information about Russia, no matter how trivial, comes under the heading of intelligence in the espionage meaning of the word. Consequently the foreign correspondent is tolerated as a kind of second-rate spy. The Tass agency forms the basis of all Soviet intelligence abroad, although most of the information that Tass gathers is regarded by us as legitimate news. It is not so regarded by the Soviet government. And since Tass correspondents are regarded by the Russian government as their agents, the government logically expects foreign correspondents in the capital to perform the same function. In view of the restrictions and this official attitude, it's difficult to see how there can be any comprehensive coverage of the Soviet Union at all until the Communist policy, Communist aims, or Communist government of Russia changes or is changed. I hope you find something useful in all of this. Downs, Bill (1943). From the William R. Downs papers at Georgetown University. Gilmore, Eddy (1954). Me and My Russian Wife. Doubleday, pp. 82-84. Lawrence, Bill (1972). Six Presidents, Too Many Wars. Saturday Review Press. Moorad, George (1946). Behind the Iron Curtain. Fireside Press, Inc., pp. 15-16. Reynolds, Quentin (1944). The Curtain Rises. Random House. Moscow-based foreign correspondents in 1943. Bill Downs is seated in front, second from the left. 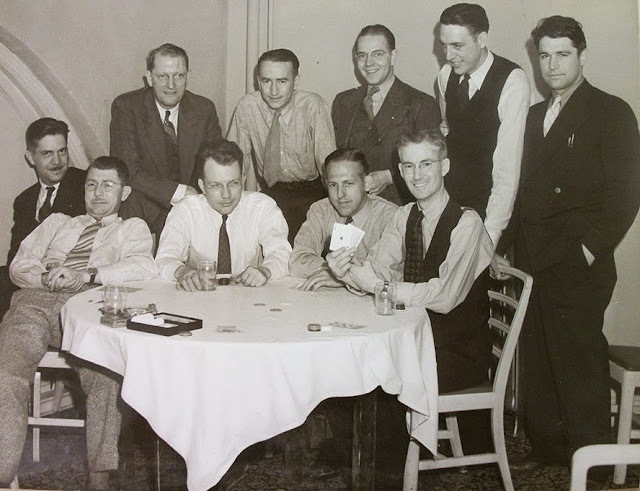 Correspondents covering the Battle of the Orel Bulge from the Metropole Hotel and the Foreign Office press department look more like form players than war reporters as they try to make head or tail of the Red Army's moves on Orel. NBC and Exchange Telegraph: Robert Madigoff, running second in the Orel Derby, put the Soviet forces 12 miles from Orel. Associated Press: William McGaffin pounding away for third. His Red Army troops were 15 miles from the town. CBS and Newsweek: Bill Downs, lost in the back stretch after placing the Red Army "less than 20 miles from Orel." Henry Shapiro of the United Press was practically left at the post, and David Nichol of The Chicago Daily News never had a chance. The Orel sweepstakes is typical of the difficulties under which American and British reporters must compete for headlines and at the same time keep within reason in trying to interpret the progress of military movements in Russia. There is not one who had not been screaming at the press department for trips to the front or, second best, for conferences with reliable political and military authorities for guidance in covering this and other stories. When the communiqué broke on July 16, about twenty villages were named. Then came a frantic searching over maps, the correspondent having the best map writing the story. Detailed maps of the Soviet Union are virtually impossible to obtain; thus old-timers who have been collecting them for the longest are the best off. After the search of the maps there was a search of the latest railroad timetables to check place names. Meanwhile copy was pouring out in takes with messengers rushing the hilly six blocks to the telegraph office where, it was hoped, transmissions were not jammed "by the weather." Daily thereafter, the reporters have risen early to collect their Red Stars, Izvestias, and Pravdas and immediately begin a word-by-word search for clues to the battle. By combining facts from official communiqués and reports from the front east of Orel you may locate the big tank battle of the previous day or tell where the Germans are throwing their greatest reserves. From these facts you get a somewhat clearer picture of what is going on. However, winning the Orel sweepstakes is going to depend on some revealing communiqué to tell who was right. Based on total Red Army advances, the Soviet forces should be in Orel now (July 20) if the movement were straight eastward. Meanwhile no one knows where the Soviet forces are located in the Orel bulge—except the Red Army and the Germans.